Last month I spoke at Facebook's Performance @Scale event about Linux BPF Superpowers. These are coming to Linux in the 4.x series, and I've been using them in new open source performance tools. We've stopped calling it eBPF (extended Berkeley Packet Filter), and are now just calling it BPF, although we need a better backronym: Bytecode Probe Framework? Naming things is hard. 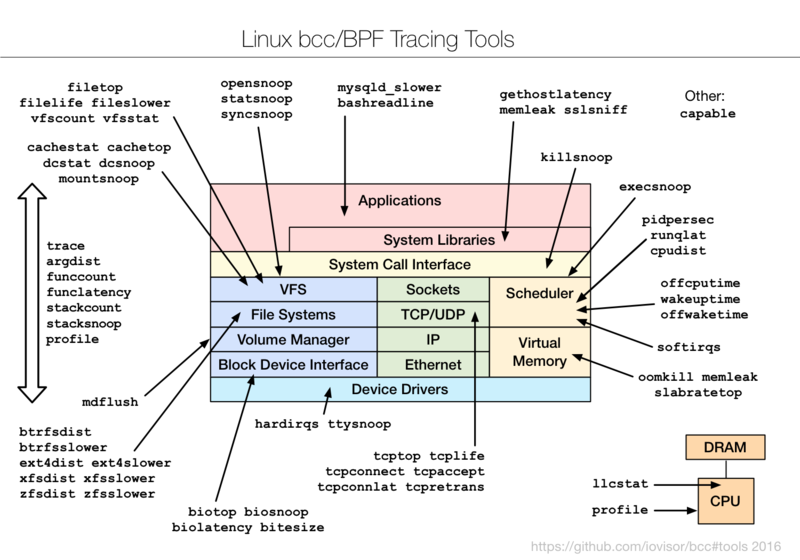 BPF is the in-kernel bytecode machine that can be used for tracing, virtual networks, and more. Alexei Starovoitov is the lead developer (he's now at Facebook), and there are developers from several companies contributing, including myself at Netflix, Daniel Borkmann at Cisco, and Brenden Blanco at PLUMgrid. So many of my favourites (from other tracing languages) now have equivalents in bcc, which is pretty exciting. Tools like execsnoop, opensnoop, ext4slower, tcpretrans, tcpconnect, and runqlat. These bcc tools are still in development and require at least Linux 4.1, which many people aren't running yet. You can think of them as a preview of things to come. But they are coming sooner rather than later: Ubuntu 16.04 (for example) will have a 4 series kernel, and isn't far away. Please watch my talk video above, and check out the other talk videos which were pretty interesting as well (although that link plays the low-res versions in Chrome; high-res versions, like I linked to above, do exist). Thanks to Facebook for having me – it was a great event.